Portland Oregon has enacted a far reaching update of their regulations on protecting trees and their urban forest. Originally slated to be effective in 2013 it will now be law as of January 1, 2015. Here is the link to the current adopted Portland, Oregon Title 11 Tree regulations as updated Jan 23, 2013 with an effective date of Jan 1, 2015. The link is to the Citywide Tree Policy Review and Regulatory Improvement Project Report entitled Title 11 Trees and includes the code language passed along with additional commentary on facing pages. An earlier report by the Citywide Tree Policy and Regulatory Improvement Project is available also in a document entitled Recommended Draft Report to the Portland City Council December 2010 details the issues and process that was involved in coming up with their new regulations. There are many reasons why trees are lost in Seattle despite efforts to protect them. The following is another example of why our interim tree ordinance needs to be updated. It lacks the protections many other cities have and does not protect existing trees from being cut down needlessly. And it points out why the Department of Planning and Development (DPD) is the wrong city department to have in charge of protecting trees. Seattle needs a city department like the Office of Sustainability and the Environment with a clear mission statement to be an advocate for saving trees and not have conflicting missions like DPD does. DPD’s primary mission is to help developers build projects and has publicly stated that their policy is to protect trees unless they limit the development potential of a lot. But even that statement is false when you look at the following example. They are giving no protection to a large 25 inch Douglas fir even when there are clearly alternative ways to build the proposed garage on this site without removing the tree.Check out this picture. The garage is to be build on the right side of the lot between the red markers in the center of the picture. DPD’s response is that it has no ability to save this tree despite clear alternatives. There is an equal amount of space to move the garage to the left of the stairs coming down to the sidewalk or just to the right of the stairs. Either of these two options would clearly allow the garage to be built and still save the tree. Note also that building the garage does not add any additional parking but is actually a net loss as it will remove two on street parking spaces. Check out DPD’s response to the next door neighbor Nancy Rottle’s inquiry and request to save the tree in the following e-mails. And check out the actual application file and note that there is no official recording of the below e-mails and DPD’s response although one would think this would be in the public record as a complaint. Also note that there is no assessment of the impact of the garage or project on Seattle’s urban canopy or Seattle’s Comprehensive Plan’s goal of no net loss of trees. There is no requirement to try to save trees whenever possible or to replace trees lost as a result of this project. I am a neighbor of this project and I also teach urban design at the UW. I am dismayed at the some of the guidance that the applicant has gotten for this project as I believe that it is actually counter to the current goals of DPD and the City’s Comprehensive Plan and am hoping that there might be some recourse to the applicant’s current plan. The project is a lot boundary adjustment to a property that has historically been an 8-dwelling apartment building in a single family zone. The through-lots face Ashworth Avenue and Carr Street, with the Carr Street lot serving as the parking lot for the apartment which fronts onto Ashworth. The property was recently sold and the applicant plans to build a house on the parking lot site and therefore requested the lot boundary adjustment in order to have a lot large enough to allow construction of the additional house. In order to compensate for the parking loss, DPD required the applicant to provide a minimum number of off-street parking spaces. To make this work, the applicant is proposing four parking spaces on the existing parking lot, and a single space in a bunker garage constructed on Ashworth Ave.
1) The proposed garage location is in an Environmentally Critical Area (I believe) and will necessitate the removal of a large Douglas fir tree which is growing above the proposed garage location. This tree is a keystone in a grove of trees* which provides valuable bird habitat in the neighborhood, and may legally constitute a “grove” under the City’s definition. The tree provides additional benefits of stormwater control (we are in a combined sewer neighborhood), heat island mitigation, air purification and carbon sequestration, as well as contributes to neighborhood aesthetics. 2) With the construction of the single car garage, a parking spot on the street will be lost, so there would be no net gain of parking in the neighborhood. This is an RPZ zone where there there is neighborhood concern about loss of parking spaces. (Ironically, the proposed bunker location will require the removal of the RPZ sign for the curb cut). 3) The snout garage will undoubtedly degrade the character of the street; neighborhood design guidelines have discouraged use of these garages as they make the street less attractive and less pedestrian-friendly. 4) The substantial cost of installing the parking garage will undoubtedly be borne by the apartment dwellers, increasing housing costs. This apartment complex has been an affordably priced alternative in a central neighborhood and it would be a shame to lose this resource. Again, there is irony in that the approval of small lots in traditional single family zones is done in part in the assumption that creating more housing will keep it more affordable — yet this requirement would likely raise the cost of the apartment rental (and certainly the new house that the applicant will build will not be “affordable” — but that is another issue). While the City, and specifically DPD, are promoting walkable, affordable neighborhoods and stewardship of the public-private urban forest — I could point out policy documents but I’m sure you’re aware of these — the developer’s proposal to construct this garage is in response to DPD’s requirement for a minimum number of parking space, which however does not actually create any additional parking space in the neighborhood, but does have other significant adverse effects that are counter to the City’s goals. – Purchase of electric bicycles and provision of bike parking. These options would address all four of the concerns listed above. (If the cost of constructing the garage is $40k, that could be $5k allocated per unit, which spread over 20 years would be $500 per year.) You would probably have additional good ideas for how to actually achieve DPD’s and other City agencies’ common and multiple goals. Another option would be to require or at least suggest the garage be built on the north side of the lot, where it wouldn’t require the removal of the Douglas fir and wouldn’t adversely affect the on-street parking loss (since there is fire hydrant just to the north that currently prevents on-street parking in this location). That solution would address concerns 1 and 2 above. I would love to discuss this with you but thought it would be most efficient to send this mail first. I did speak with Emily Lofstedt and since she is just following the letter of the code and not in a position to creatively address the bigger picture she recommend that I talk with you. Is there a good time and phone number that I can reach you? * This tree may qualify as Exceptional as it is part of a continuous canopy of trees larger than 12″ dbh. These trees are not represented on the applicant’s survey. I wanted to check back to ensure that you received my message below and to arrange a time to talk with you about this project. Is there a time that I could talk with you this week? Please let me know the best time/number to call. I have spoken with several neighbors who are concerned about the guidance that DPD is giving the applicant. I have received your messages, but needed to look into your questions before getting back to you. 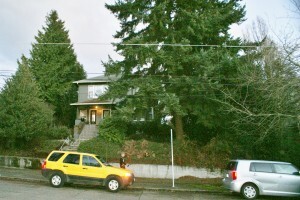 In this case, we determined that the east portion of the property, fronting on Carr Place N, could qualify for development as a separate building site under the lot area exceptions provided in the Land Use Code for Single Family zones (Seattle Municipal Code Section 23.44.010.B), so long as five parking spaces legally provided on that property for the existing building could continue to be provided on the site of that building. An application for a lot boundary adjustment was submitted, applying our Director’s Rule 13-97 which allows the adjustment of a lot line between two legal, undersized lots, so long as their sizes remain the same. The applicant has proposed to relocate the parking spaces so that they will be on the same lot as the existing building after the lot boundary adjustment. As you note, one of the proposed spaces will be a bunker garage accessed off of Ashworth Avenue North. The zoning approvals that are required for this – approval of a lot boundary adjustment and zoning review of the relocated parking and the new garage – all are “Type I” approvals under our Land Use Code, meaning they involve little discretion. In the case of Type I reviews, we have no authority to impose conditions to address impacts, or to consider whether the proposed development is consistent either with adopted policies or with good planning principles. If the proposal meets the standards of the code, we are legally obliged to approve it. Although the points you raise, for example about costs and visual impacts associated with the garage and the importance of retaining mature trees, may well be valid, we are not able to condition or reject a permit application on these bases if the proposal meets the letter of the code. Also, even if the applicant wished to voluntarily pursue one of the alternatives you suggest (payment towards an RPZ, bicycles or bus passes) we have no authority to accept one of these in lieu of a code-required parking space. I will share your message with code development staff as you raise points I think they may want to take into consideration as they prepare future amendments to the Land Use Code. However, any changes made could not be applied retroactively to this project. I have checked into a few of the specific questions you have raised. You are correct that a small portion of the property is mapped as an Environmentally Critical Area due to steep slope, however, one of our geotechnical experts has concluded that the proposed work is far enough away from the ECA that the ECA is not of concern for our review. I have also checked with our tree expert. Based on the information available to us, including the site plan submitted and our aerial photos, there does not appear to be a grove within the meaning of our standards (our Director’s Rule 16-2008). Addition information has been requested from the applicant regarding the individual Douglas fir tree you have asked about. I know this isn’t the answer you hope for, but I hope it helps to clarify the scope of our review. You may view the Land Use Code provisions and Director’s Rules mentioned in this message online at http://clerk.ci.seattle.wa.us/~public/code1.htm andhttp://web6.seattle.gov/dpd/dirrulesviewer/default.aspx. Thanks for your response. I do have several questions that I would love to discuss with you, but first it would help me to understand the basis of the 5 “code-required parking spaces.” If the existing code were applied without any discretion, wouldn’t DPD have needed to require 8 parking spaces for the 8-unit apartment? How was the opinion rendered that 5 spaces were adequate, if not at the discretion of DPD? Why 5 and not 4, or 7, or 8? Secondly, the site with the proposed location of the garage is in approximately the center a mapped critical area, and the garage would need to be built upon that steep slope, so I do not understand how the geotech could have reasonably made the decision that the proposed work (of the garage) is “far enough away from the ECA” — this is simply impossible. Also, there are indeed (8) 12″ diameter trees within a connected canopy of trees, including the Douglas fir in question, and there are significant trees missing on the applicant’s survey even adjacent the property line. What would be required to verify this possibility? Do I need to go to the expense of hiring a licensed surveyor, or can I map them myself? (I am a licensed landscape architect). Thank you for your assistance and I do apologize for causing you any trouble — I’m sure you are quite busy. However, this issue of codes and interpretation of codes that are counter to adopted policies (and with good planning principles) should be of concern to all in DPD and to our elected leaders. I am grateful that you will forward this example of Seattle’s codes being essentially out of compliance with City policies to code development staff. I would appreciate a response from you with regard to my above questions, and I would also still like to talk with you via a phone call if you can be available. I know the last two weeks have been holiday, but I haven’t heard back from you and would still like to discuss the City’s requirement that a single car garage be built in an Environmental Critical Area, which will remove parking spaces from the street (which I’ve just had confirmed is two spaces rather than one) and require the removal of a large (25″ DBH) Douglas Fir. I’ve also gotten an opinion that the removal of the fir and construction of the parking garage will jeopardize my adjacent 24″ fir. There is also the likelihood that the 25″ fir that would need to be removed would be considered an Exceptional Tree as it is part of a connected group of trees greater than 12″ DBH. Is there some recourse to this requirement by the City that there be a single car bunker garage constructed, which is counter to City policies regarding walkability, housing affordability, and urban forest stewardship? Can we please discuss the possibility of relieving this requirement? Sorry for the delay; I have been waiting for additional information about the trees. A staff member with expertise in that area will visit the site this week. Our maps of steep-slope Environmentally Critical Areas are advisory, and we rely on additional topographic information that is available to us. Although there is a steep slope mapped in the vicinity of this site, our geotechnical engineer has evaluated the proposal and determined that the work is not in a steep-slope ECA. From looking at our maps, it appears to me that the steep slope on this property is minor and likely the result of grading for the street, in which case it would likely be exempt from steep-slope ECA standards under Seattle Municipal Code Section 25.09.180.B.2.b. Regarding the number of parking spaces required to be provided on the site of the building: We determined that the east portion of the property, fronting on Carr Place N, could qualify as a separate legal building site and be separately developed in accordance with a lot area exception provided at SMC 23.44.010.B.1.d. However, under that section, if a parcel has been used to meet the legal parking requirement for a building on a neighboring parcel, that parking must be replaced on the same parcel as the building it serves in order to free the other lot up for separate development. The general code requirement for an eight-unit building would be eight spaces. The parcel fronting on Carr Place is developed with a garage and a surface parking area. At times it appears that more than five cars have been parked there, but we determined that the area could accommodate only five spaces meeting code standards. For that reason the legal building site approval was conditioned on the relocation of five parking spaces. Although I understand your point that provision of a new curb cut from Ashworth Avenue effectively eliminates street parking, we cannot prevent the applicant from taking access to parking in that manner, so long as code development standards are met. There also is no means, under the code, for us to waive a portion of the parking requirement in order to prevent such a curb cut. The applicants could seek a variance from the parking requirement, but we cannot compel them to do so, and there is no assurance that a variance would be granted if applied for. In recent years the City has reevaluated some of its parking requirements, and I anticipate that this will continue to be a subject of discussion. I will pass the points you have made along to our code development staff for their consideration as codes are revised. However, our review of this individual project must be based on whether it complies with the standards that are now in the code. With regard to the code requirement for the number of parking spaces, as you indicate it is 8 spaces, which the apartment building now provides. Six (6) of these spaces are in the parking lot and are marked as such (and I have often observed seven cars parked in the lot.) There are six cars parked there right now, with plenty of room to spare. As you noted in your Opinion Letter of July 29, only five spaces in the parking lot would be legal based upon the need to back into the non-arterial of Carr Street. However, since there are also two spaces in the garage — which is not served by the same drive as the parking lot — why aren’t these spaces required to also be replaced? Your letter states that these spaces would “need to be relocated to a legal space on Lot 22 in order for Lot 7 to be freed for separate development.” If you are following the letter of the code, why aren’t 7 spaces required? On the other hand, many multi-family projects in Seattle these days are being exempted from providing parking. Can you tell me how this is made possible? Also, can you please tell me when the staff member with tree expertise will be visiting, or put me in touch with that person, so that I can arrange to be there? We counted the garage spaces when we determined how many legal spaces could fit on the portion of the property that had been used for parking. There have been specific code amendments eliminating parking requirements for residential uses in urban centers or station area overlay districts, and in commercial or multifamily zones in urban villages close to frequent transit (Section 23.54.015 Table B) and for single-family residences in Single Family zones on lots less than 30 feet wide or less than 3,000 square feet in area with no alley access (Section 23.54.015.B.1.5.) However, none of these circumstances apply to the property you have asked about. Seth Amrhein is the staff member who will be visiting the site to observe the trees. It is possible that he will be there today. His number is 206-386-1981. Here is what is currently in place as to removing trees in Seattle as of November 2013. . The “interim” tree ordinance passed in 2009 by the Seattle City Council is the governing ordinance. It came about because of the loopholes in removing trees in Seattle exposed by two citizen battles. Protecting trees in the Northwest Grove at Ingraham High School in North Seattle and saving Waldo Woods in the Maple Leaf area. This lists a fine of up to $5000 for violating the ordinance. This states that no exceptional trees may be removed on developed property over 5000 square feet. This one clarifies what an exceptional tree is and has a list of tree sizes for trees. For example it states that for Douglas firs, trees larger than 30 ” in diameter are exceptional and may not be removed unless they pose a hazard. The interim ordinance is clearly lacking as large trees continue to be cut down without regard for their size. There is also no requirement for replacement trees. Seattle has been working on updating the tree ordinance for four years now. The Seattle Department of Planning and Development has come up with several drafts which have not been acceptable to members of the public and others. DPD’s approach has been contrary to the direction of the Seattle City Council which wanted stronger regulations to protect trees.DPD currently does not require or enforce getting permits to remove most trees in the city. They have operated what they call a complaint system which doesn’t work because there is no way to stop someone cutting down a tree and a complaint after the fact doesn’t save any trees. DPD’s draft proposals for this reason were also not viewed favorably by the Seattle Urban Forestry Commission. The next draft of a proposed tree ordinance was to be released in Jan or Feb 2014. This is now most likely up in the air as the current Mayor, Mike McGinn, was defeated in the Nov election and the new Mayor, Ed Murray, is likely to view this issue with fresh eyes..
Any new ordinance to be successful needs to require permits to remove any tree over 8 – 10 inches in diameter and require a two week posting of all proposed tree removals so any conflicts can be addressed. Also unless replacement of trees cut down is required, either on site or off site, Seattle will continue to lose canopy. This is despite the Seattle Comprehensive Plan stating a yearly goal of no net loss of canopy..
Cities like Portland, OR; Vancouver, WA, Lake Forest Park,WA and Kirkland, WA currently require permits to remove large trees. Permits are currently required by SDOT to prune or remove trees in the right of way and by DPD to remove hazard trees (although there is little or no evidence this is working). Save the Trees- Seattle is a citizen’s coalition in Seattle, Washington working to update it’s current ordinance dealing with trees and Seattle’s urban forest. We have opposed the Seattle Department of Planning and Development’s (DPD) past efforts to weaken and repeal existing protections for Seattle’s urban forest and trees. As the Seattle Urban Forestry Commission noted, DPD’s 2011 draft would have removed existing protections for trees and tree groves on 99.5% of Seattle property. DPD proposed that education and incentives would increase our urban forest canopy more than strengthening existing protections. We disagree. A second draft of DPD’s proposal was released in 2012 and was withdrawn for further revision after the Seattle Urban Forestry Commission, Save the Trees-Seattle and other groups criticized its weakening of tree protections on private property. DPD’s intent was still to not regulate tree protection but to remove all protections. DPD is currently working on a third draft of a new tree ordinance that they plan to release in Jan 2014. There work is being done behind closed doors and is not involving the public. The schedule is to try to pass a new ordinance the beginning of 2014. Consolidate oversight, regulation and enforcement in an independent department other than DPD, that does not have a conflict of interest such as the Office of Sustainability and Environment or the Parks Department. Require all real estate sales to disclose trees on property that would require a permit to be removed. This website is being added to as time permits so please have patience as we work on it. We try to keep more current tree and urban forestry news items posted more timely on our facebook page. – Friends of Seattle’s Urban Forest.